To view a 3D demonstration of Screenflex room dividers visit https://www.schoolroomdividers.com/interactive-room-divider/ or contact a sales representative at 855-308-2122. Temporary Classrooms, Meetings, multi purpose rooms. 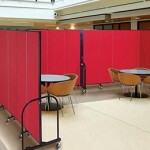 To learn more about our portable room dividers and other great products, visit us online at Screenflex.com or give us a call at 855-308-2122. Get the most out of your space, with Screenflex.